Score a FREE 2-year subscription to Bridal Guide Magazine! There are NO strings attached and you will NEVER receive a bill. Free Personalized Father’s Day Card! Check out Cherishables.com as this site is offering a FREE Personalized Father’s Day Card + FREE Shipping! Simply create your custom Father’s Day card and use code DAD14C at checkout. You will not need to provide any payment information since it is 100% free. Note this offer is valid through June 1st, or while supplies last. Check out the Free Spring Vegetables eCookbook from MrFood.com and Sunshine Sweet Corn! This yummy free eCookbook offers recipes to make delish radishes, green beans, tomatoes, onions and, of course, sweet corn! Enjoy…it is so good! Free Activities for Kids at Michaels! Today only, check out The Free Family Craft Time: Teacher Appreciation at Michael’s! Honor your teacher with a handmade personalized gift. Also sign up your kids for Michael’s summer crafting program, Passport to Imagination. Free Quart of Paint at True Value Stores! Tomorrow, May 17, True Value stores are giving away FREE quarts of EasyCare Ultra Premium satin paint with this printable coupon. Offer good while supplies last. Click here to find a location near you. B1G1 Free Entree at Mimi’s Cafe! 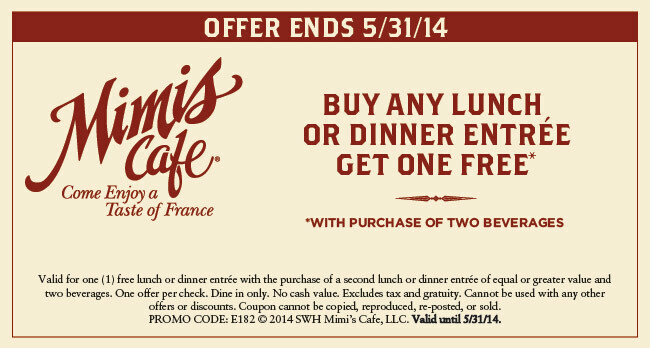 Print a Mimi’s Cafe coupon good for a FREE Lunch or Dinner entree when you purchase another lunch or dinner entree AND two beverages. This offer ends 5/13/14. Free San Diego Padre Tickets! Score free San Diego Padres Tickets! Complete a free online Mercury auto insurance quote and they will send you a ticket code redeemable for two tickets to a San Diego Padres 2014 regular season eligible home game! Happy National Public Gardens Day – Free Admission! National Public Gardens Day is an annual celebration of the nation’s public gardens to increase awareness of the important role botanical gardens play in promoting environmental stewardship, plant and water conservation, green spaces, and education in communities nationwide. Today only check out the Free admission – National Public Gardens Day! Get a Dozen Free Roses from 1-800-Flowers. Your mother would love these on Mother’s Day! All you need to do is use code FREEROSES and checkout using V.Me Account and pay shipping and taxes. V.Me. is a Free Service like Paypal – you can connect it to any credit or debit card and doesn’t require you to sign up for a new credit card. This offer ends May 8th at 3:00. Free Gibson Guitar Artists Poster! Simply request a FREE Gibson Guitar Artists Poster! This poster features Bob Marley, Jimi Hendrix, and more.